iTookOff Online is a free online app that manages and tracks your vacation, sick, personal, and whatever else time in the cloud. You can check your paid leave balances wherever you have an internet connection. iTookOff Online offers unparalleled customization options and single user accounts are absolutely free! It's simple! Sign-up for a free account, enter your current leave balances, how they accrue, and we'll update your time automatically. 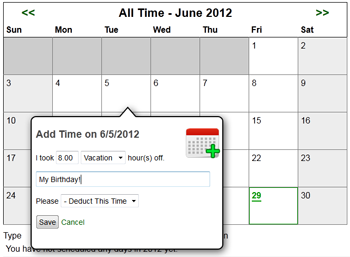 iTookOff will track your individual days off as well on an easy to use calendar. We use the same industry standard SSL encryption that banks use and backup your leave daily. It's free for single users and cheap for small business! iTookOff Online will track any other types of time on a daily basis. Got employees? iTookOff Online will soon offer flexible pricing on enterprise level features to meet your needs whether you're a small business or a massive company. Single user accounts are FREE! Multi-user accounts are still in development and will be free while we're in beta.